A Bidding Masterclass was held last week by VisitBritain in order to offer tips and techniques to Association specialists keen to take their bids to the next level. The session focused largely on sharing best practice, where delegates were invited to share real life examples to discuss with their peers how obstacles have been overcome in the past or could be overcome in the future. I was very excited last week to attend the VisitBritain Bidding Masterclass in the beautiful surroundings of the prestigious Pembroke College, Oxford. My day started with the short 20-minute journey to Belfast International Airport for an early flight to London Gatwick and from there I made my way by train to Oxford. The aim of the event was to build on the basics of bidding and how we can refine our approach and be more tactical when trying to win both International and National Association events. Industry experts Caroline Mackenzie and Susie Hide from Global Association Partners facilitated the event and divided the day up into a series of presentations, Q&A sessions and group case studies. Their wealth of knowledge was hugely beneficial to learn from as they shared personal experiences and insights into what they felt influences the decision-making process. Having joined ICC Belfast’s Association team late last year, the Bidding Masterclass was my first industry event. I knew it would be a particularly valuable training and development opportunity and would also be my first opportunity to network with fellow industry professionals from venues and convention bureaus throughout the UK, so I was delighted when it exceeded my expectations. Detailed below are some of my top takeaways from the day. Getting a decision maker, or even an influencer, to come and see a venue in person is half the battle as a lot of organisers have preconceptions about certain destinations or sites that might be inaccurate or outdated. By hosting an organiser in your city and giving them a tour of your venue, opinions can be transformed, and myths can be dispelled. It also provides an opportunity for you to showcase your offering as being suitable not only for large, flagship Association events but for smaller more intimate member gatherings that run throughout the year. 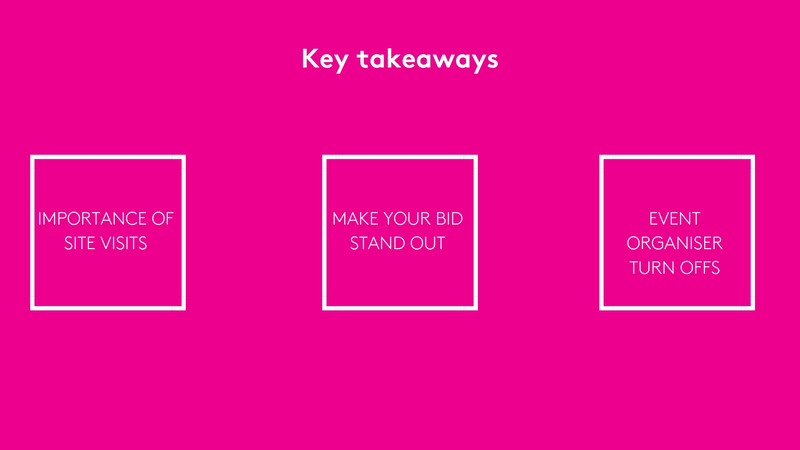 First impressions count and making your bid stand out from the rest is key to winning any conference. As well as showing how you can bring the organiser’s ideas to life in your venue, it’s important to also think outside the box. If you have a light bulb moment and think of a novel idea for a conference that would make it unique to previous years’ events, be sure to moot it with the event organiser; these ideas can be what make great conferences amazing. If you have a light bulb moment and think of a novel idea for a conference that would make it unique to previous years’ events, be sure to moot it with the event organiser. One such example of a suggestion made in a bid that went on to bring an event to the next level was a dedicated area for minor surgeries to be performed during a medical conference. These big ideas can help to build a legacy for both an Association as well as for a destination and venue so it’s really important to think of the big picture. Past events that you’ve hosted can also act as your ‘shop window’. By outlining what has worked well for clients in the past, event organisers will have a better idea of your capabilities. Of all the areas covered, this was what I found most interesting. Being new to the industry, I realise it’s important to nip any bad habits in the bud, so it was great for me to hear more about what event organisers don’t want, so I can focus my efforts on delivering what they do want. Susie gave us an insight into her personal experience and told us how at one stage she was receiving around 300 emails a day and was taking 150 flights a year, highlighting just how time-poor event organisers are. Rather than sending unsolicited emails, I know now to keep messages, short, sweet and personal; one size doesn’t fit all. Another frustration Susie shared from the event organiser’s perspective was that honesty is the best policy and rather than ignoring an aspect of a bid in which you mightn’t be as strong as the competition, address it upfront and offer a solution. Not only does this save hassle for the event organisers, it gives them more time to focus on the areas of strength that you feel makes your bid world-class. I’m learning something new about the industry on a daily basis and it’s great to have joined the team at such an exciting time for both Belfast and for our venue and I’m looking forward to developing further as time goes on. If you’d like to connect and hear more about what ICC Belfast has to offer, join me at Confex where I’ll be exhibiting along with the rest of Team Belfast on 26 & 27 February in the Olympia London. Hope to see you there!